I’ve just uploaded a new Stamp a Number/Letter activity on my Teacher’s Pay Teacher’s store. I created a stamping activity so that my kiddos can work on number and letter recognition in a fun way! Don’t forget that everything in my Tpt store is on sale until the 30th! Even this new item is on sale! Right next to my Promethean Board! I can sit in the blue chair (which is still a long way down even for my short self! 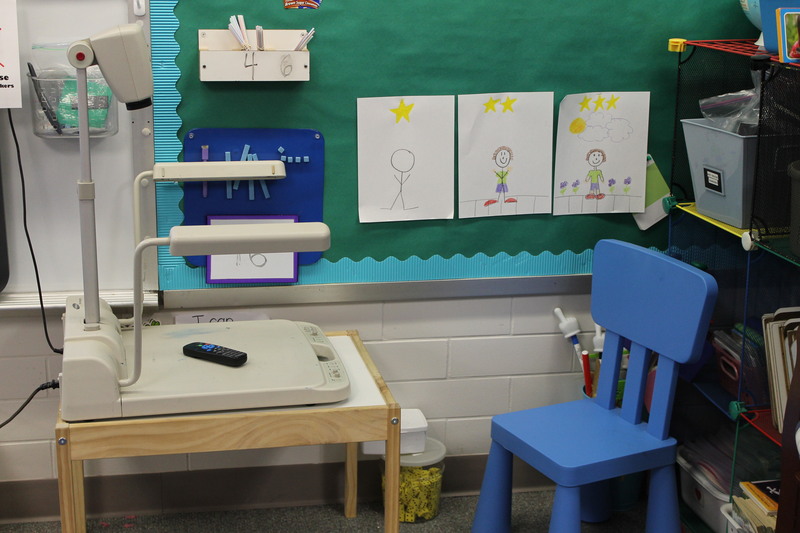 ), be right with the kids, and see the Promethean Board right next to me. MUCH better!! We are all getting ready for Halloween here at my house and to celebrate, I’m having a sale in my Teacher’s Pay Teachers store!! From October 27th-October 30th, EVERYTHING in my store is 20% off!! EVERYTHING!! 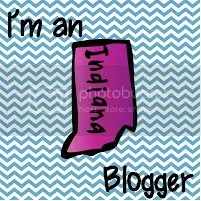 I’ll be adding more new products all weekend long, so be looking for those! We started learning about greater than and less than this week, and although we don’t need to teach the actual symbols in K, I think some of my kids are ready for it. We made our own “Al the Alligators” who will munch big numbers. 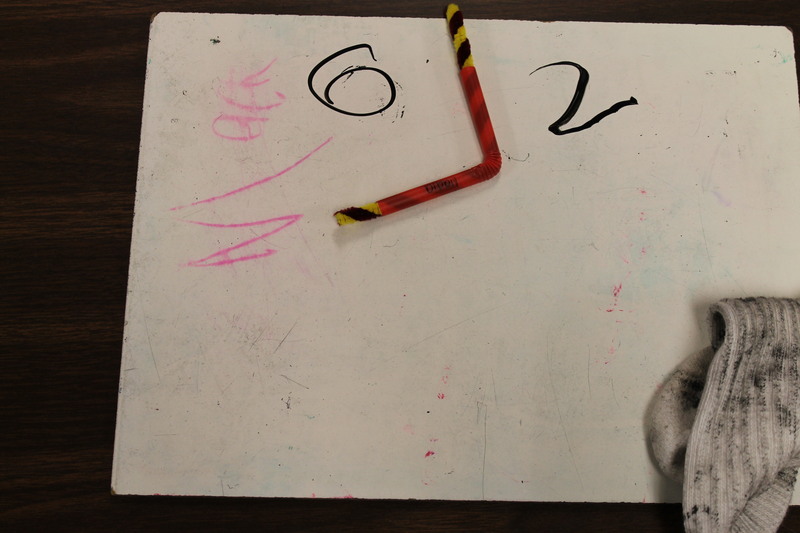 We used bendy straws and pipe cleaners and then got out our white boards to practice some munching! When I decided to include recording sheets at my Math Work Stations, I also decided that it would be beneficial to add some to my Literacy Work Stations. I got a few from some Teacher’s Pay Teacher’s friends and came up with a few of my own (after finding some ideas on Pinterest). This is an idea I found on Pinterest. I cut vinyl from my Cricut machine and adhered the letters on to spoons (white for the upper case and clear for the lower case). 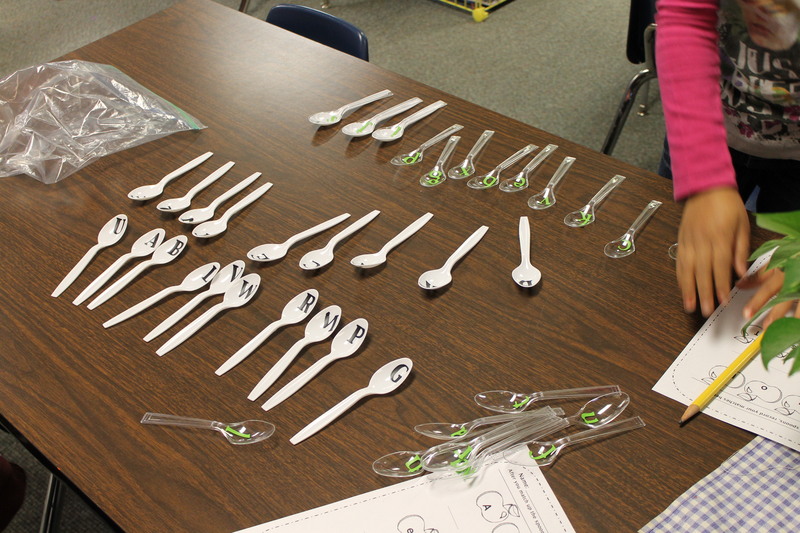 The kids match the upper and lowercase spoons to each other, then they fill in the missing upper and lowercase letters on this Spoon recording sheet I made. I got this Roll a Letter game from Kathleen Pedersen from Growing Kinders. We can play it two ways…right now we are rolling the large die and writing down the upper and lowercase letter that comes up. In another week or so, I will change out the pictures and the kids will have to write down either the beginning or ending sound they hear in a word. This one is also from Kathleen’s It’s Fall Ya’ll pack. 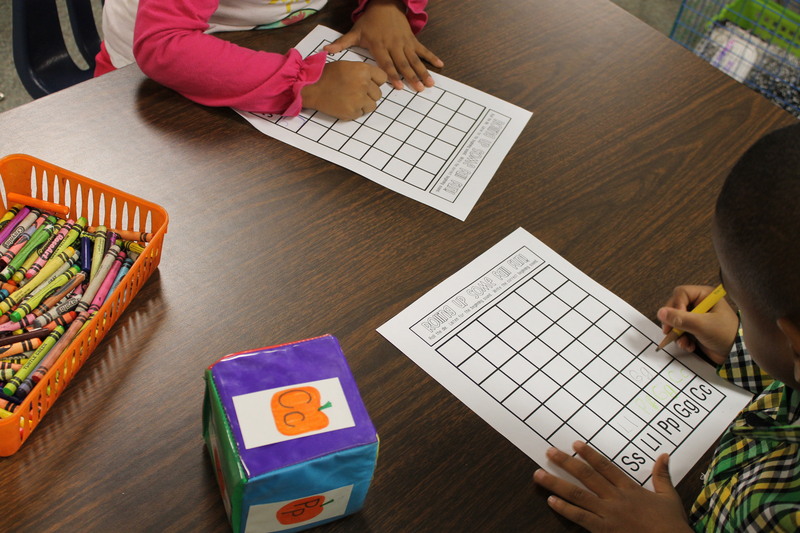 The children roll the dice and find a fall themed picture that has the same color word written on it and color it that color. We are working on recognizing color words right now and I’ll change it out to sight words in the next few weeks. This last activity is from Plenty of Pumpkins by Karen LeBlanc. 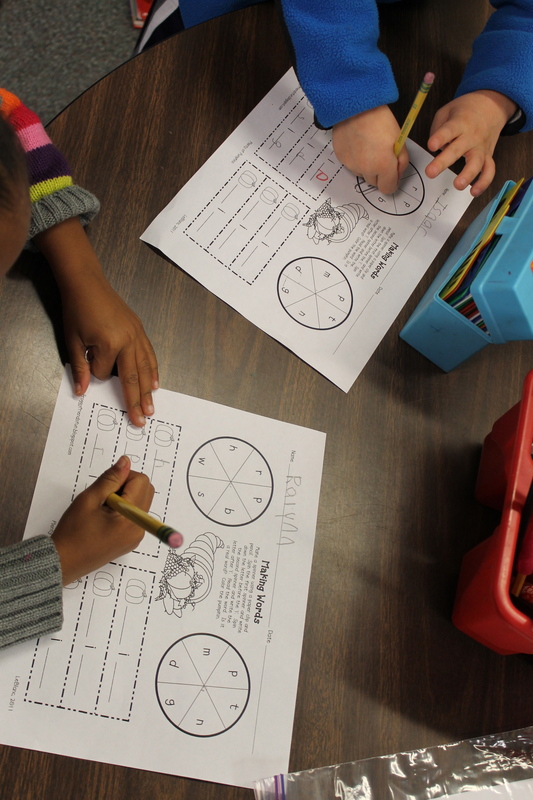 The children use a pencil and a paperclip as a spinner. They spin the first letter of the CVC word on the spinner on the left and the last letter using the spinner on the right. The kids then read the words to determine if they are real or nonsense words. 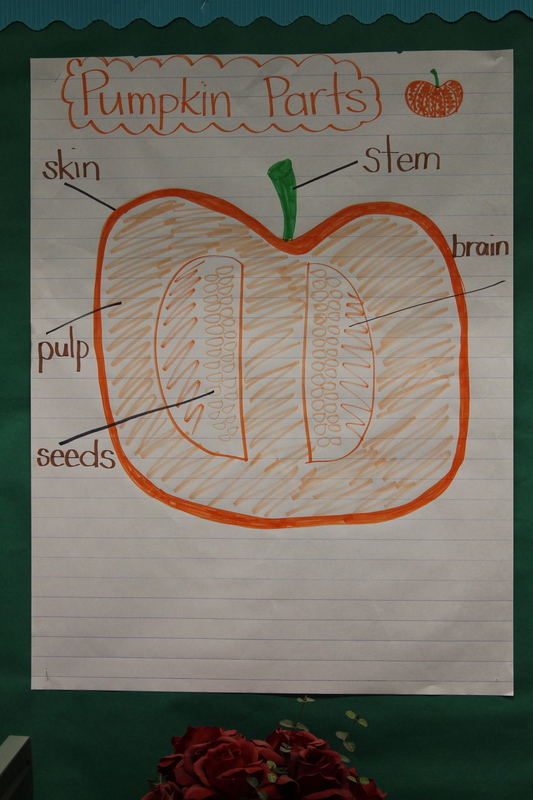 We talked about how this is a cross section of a pumpkin and what lives inside the pumpkin. 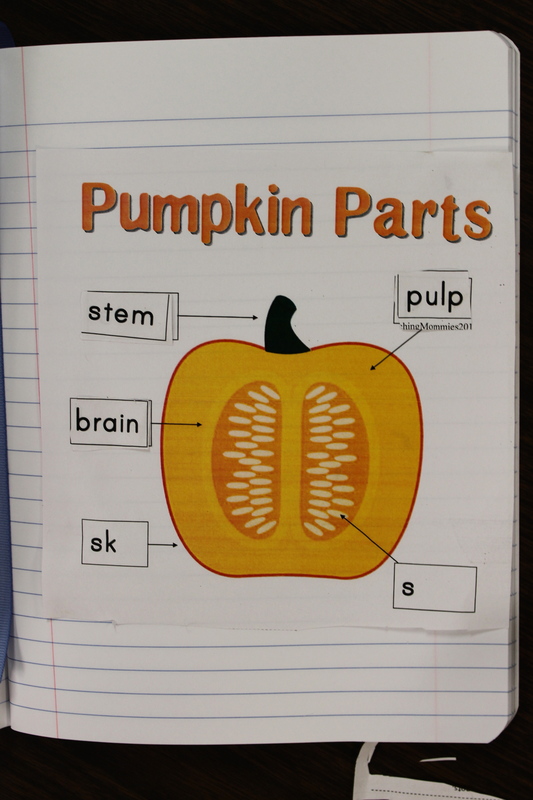 The kids were surprised to learn that a pumpkin had a brain just like they do! Over Fall Break, I decided that at each Math Work Station, my kids were going to have to show their work after completing each activity so that instead of me constantly walking around watching for mastery, they will show me their work and their level of understanding. I know some of you might be saying, “Well Duh!” of course they should be showing their work (and when it hit me, that’s what I said! ), but I needed to get comfortable with using the Math Work Station tubs first before adding this element in. As many of you might remember, I spent all last year figuring out what would work and not work in them for 5 and 6 year olds and what would and would not keep their attention. 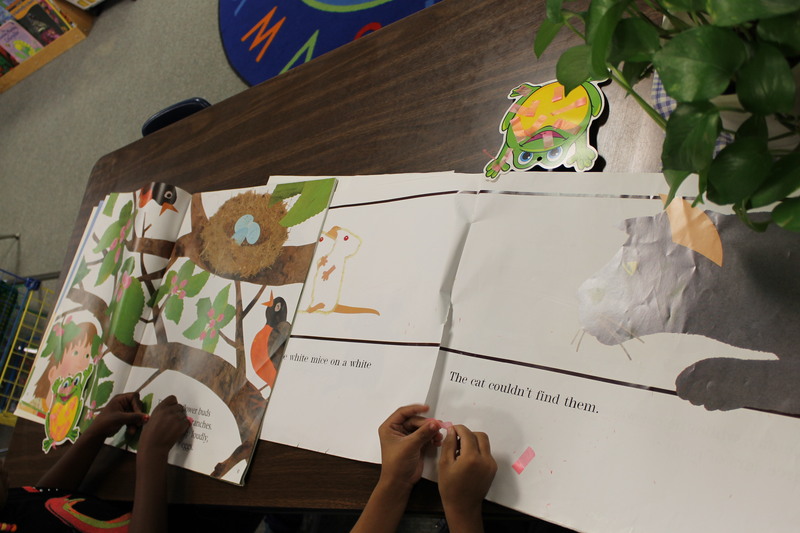 This activity came from Marsha McGuire’s I-Spy a Scarecrow pack on Teacher’s Pay Teachers. 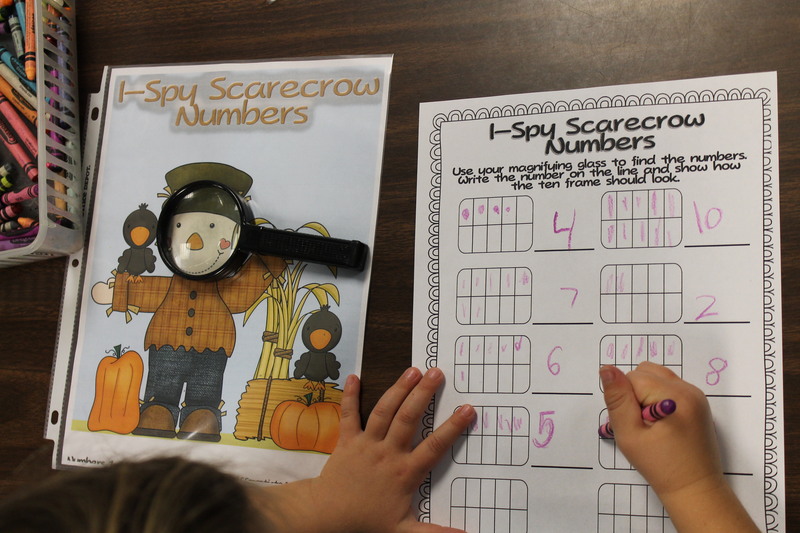 The kiddos use a magnifying glass to locate tiny numbers hidden in the scarecrow picture and then represent those numbers on the ten frame sheet included. This activity is from my Target Table Scatter freebie sheet. 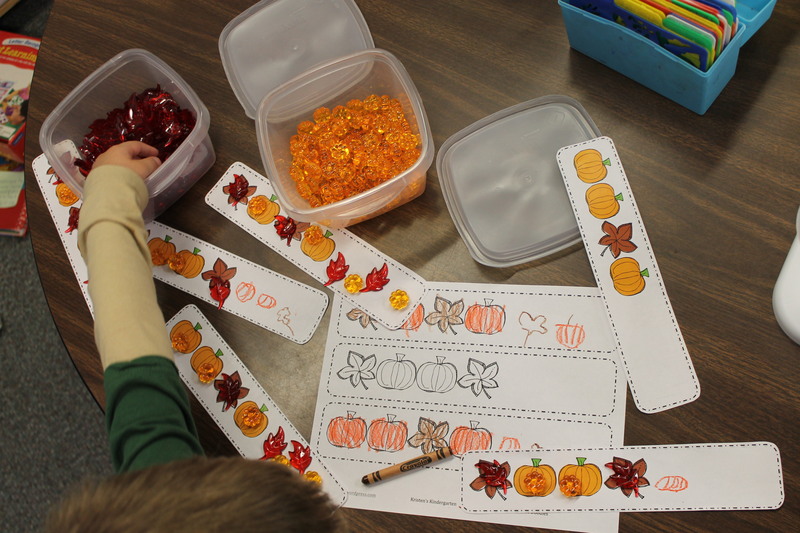 The kids use the leaves and pumpkins to complete the patterns (yes I know patterning is gone from the CCSS). I am letting the kids explore the shapes for a few days and then I will add in a ten frame composing activity. I have three more activities I need to take pictures of this week, so I’ll be back to share them soon! 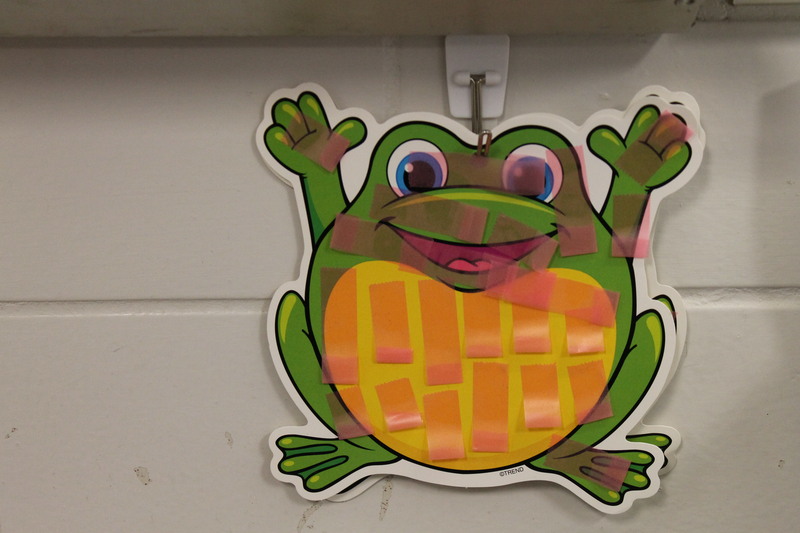 We place them on these laminated frog die-cuts. I also fold under the ends of the tape so the kids have an easier time lifting them on and off and re-using them. I punched a hole in the poor frogs head so that we could hang them on a hook right under the chalk ledge. The kids just hang them back up here when they are done. Previously, the tape and frogs would get lost in the tub of big books and this has helped so much! Thanks to all 26 of you wonderful teachers who came to my session!